Michael Dunlop won the opening 1,000cc race at the Southern 100 for the sixth time in seven years last night. After seven thrilling laps of the 4.25-mile Billown Circuit on the Isle of Man, the Bennett’s Suzuki rider edged out Manxman Dan Kneen by 0.15 seconds. Dunlop led after lap one, but Kneen had hit the front by the end of the second circuit, only for Dunlop to regain the lead on lap six. Bradford’s Dean Harrison completed the podium positions in third. For Ballymoney rider Dunlop, this was his 18th success at the Southern 100 meeting but he was made to battle all the way by Penz13.com BMW pilot Kneen. Kneen set the fastest lap of the race at 114.185mph, with Dunlop also breaking the previous lap record for the race with 113.910. “I felt a bit rusty as I haven’t raced since the TT so it’s good to be on a bike again. The bike wasn’t running 100% but we’ll get it sorted,” said Dunlop after the race. 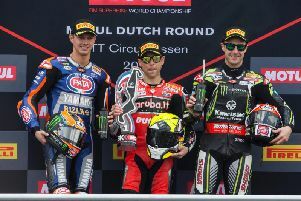 English riders Jamie Coward, Ivan Lintin and James Cowton made up the top six. Race debutant Joe Thompson won the concurrently-run 600cc class from Isle of Man rider Brendan Fargher, with Darryl Tweed third. Tweed came home ahead of fellow Ballymoney rider Seamus Elliott to take the 125/400cc honours for the second year in succession with Dan Sayle from the Isle of Man claiming third. Richard Charlton was the victor in the 600cc B event. Racing continues on Wednesday night with four scheduled races down for decision. The main Solo Championship race takes place on Thursday, with Dunlop favourite to win the feature race for a fourth time.